If a person has any conscience at all, the act of lying brings inner conviction and feelings of guilt. But being caught in a lie is even worse! It’s humiliating. I remember as a child lying to my mother about something I broke. It probably was only a few days, but in my memory, it was weeks and weeks of torment inside of me, feeling so guilty and bad about myself, and afraid to confess. When I finally did confess, being the awesome mom she is, she quickly forgave me. The loss of what I had broken was irrelevant to her. The fact that I had lied to her was huge. Thankfully, she recognized that I had already been punished by my own conscience and had learned my lesson! I am so grateful that even as a child, God’s Holy Spirit was convicting me of truth! Each piece of the armor of God is equally important, but the belt of truth is mentioned first, so I think it holds an even greater emphasis for our defense against the strongholds of our enemy. As we have learned, strongholds begin in the mind. And right thinking—truthful thinking—is essential for the believer. It is foundational to our Christian life, both in our doctrine and in our behavior. Note that the belt was worn at all times. We do not wait until we are in a spiritual battle and then look for the truth. We live in the truth, girded about by the truth. It is part of our daily life. This is a practical application, as we must make the study of God’s word a daily part of our life, and we must believe and live out the truth of that word in our daily life. We are to “gird” our loins with the truth. The word girded (Strongs 4024) [perizōnnymi] means to fasten garments with a girdle or belt; to gird around or about; in the NT meaning to wrap oneself around, to be wrapped around, spoken in reference to the long flowing garments of the Orientals which were pulled up and knotted at the waist for freedom of movement. The act of “girding” indicates we must make truth a practical part of our life: no lying, no deception, no half-truths. Live truthfully, and tell the truth! Literally, we are “wrapped up” in the truth. So, how do we know what is true? · Purity from all error and falsehood. · Truth, love of truth, both in words and conduct, meaning sincerity, veracity, with a sincere mind, with sincerity of heart, not merely with external rites; if we do not act in sincerity, we are lying, behaving in a hypocritical way. Simply put, it is living an authentic, real life (not hiding behind a mask or pretending to be something you’re not), allowing God’s word to be our standard. Essentially, we are living out in practice what God’s word declares to be true. Truth appears in 110 verses in the New Testament! Let’s look at just a few, to give us some insight of the power of truth as part of our spiritual armor. First, let’s look at the other uses of the word in Ephesians. The gospel is the truth by which we were saved. It is what we are standing firm in. It is our firm foundation, and the victory from which we resist our enemy. All thoughts which attack this truth can be denied, because we are sealed in Christ with the Holy Spirit. Ephesians 4:14-15 – As a result we are no longer to be children, tossed here and there by waves and carried about by every wind of doctrine, by the trickery of men, by craftiness in deceitful scheming; but speaking the truth in love, we are to grow up in all aspects into Him who is the head, even Christ. One of the schemes our enemy uses to build a stronghold in our life is wrong doctrine – causing us to believe things which are not true. One of the most common areas is the character of God. Because of some experience or teaching, we begin to believe thoughts that are unworthy of God, and that are not true of God. Instead of holding fast to the knowledge of God as He has revealed Himself in scripture to be, we form our own idea of God and begin to worship that idea rather than the One True God. This usually happens when we define God by our own human understanding. You face something difficult in your life, and you think, “If God truly loved me, He would…” or “If God truly was all powerful, He would…” When God doesn’t meet our expectations, we begin to believe things that are not true, rather than by faith, accepting He is who He says He is no matter my understanding or experience. The truth, contained in scripture, as God has revealed Himself to be, protects us from the schemes of doubt and fear the enemy will deceitfully use against us. And leaning into that truth, embracing it, wrapping ourselves in it, keeps us firm and steady in our faith, even when we do not “feel” like it is true. Ephesians 4:20-25 – But you did not learn Christ in this way, if indeed you have heard Him and have been taught in Him, just as truth is in Jesus, that in reference to your former manner of life, you lay aside the old self, which is being corrupted in accordance with the lusts of deceit, and that you be renewed in the spirit of your mind, and put on the new self, which in the likeness of God has been created in righteousness and holiness of the truth. Therefore, laying aside falsehood, speak truth each one you with his neighbor, for we are members of one another. Ephesians 5:6-9 – Let no one deceive you with empty words, for because of these things the wrath of God comes upon the sons of disobedience. Therefore do not be partakers with them; for you were formerly darkness, but now you are Light in the Lord; walk as children of Light (for the fruit of the Light consists in all goodness and righteousness and truth). Truth is characteristic of a believer. In Ephesians 4 and 5, Paul is teaching us what it looks like to live in the unity of the Spirit of God, within the body of Christ. He is describing the body as a unit, and how it works together, but emphasizes that these characteristics of Christ are lived out in us as individuals. In turn, this strengthens and grows the body. First, we need to understand that truth is in Jesus. If we belong to Christ, then according to Scripture, His Spirit indwells us, so there should be a high awareness of truth in us, and an abhorrence of lying or deceit. If a Christian lies or deceives, he should feel guilt and conviction because the Spirit of Christ indwells us, and He is truth. (John 14:6, John 1:14). Second, the new life which Christ has given us was created in truth, and consists of truth. Truth for the believer is a “barometer”, a plumb line, by which we can judge every thought, every idea, every doctrine, every belief, anything and everything that comes into our life. And we find that truth in the word of God. John 3:21 – But he who practices the truth comes to the Light so that his deeds may be manifested as having been wrought in God. Truth is a “gauge” of our spiritual condition. If we find ourselves not wanting to be in God’s word, or avoiding being around other believers, we may need to ask ourselves why. A person living in truth desires fellowship with Christ and His body. John 4:24 – God is spirit, and those who worship Him must worship in spirit and truth. Truth is a prerequisite for worship. We cannot have hidden sin in our life and think we can still worship God. Truth frees us from the power and burden of sin. Facing what is true (confession), and responding, by repentance and making restitution to someone we’ve hurt, releases us from the guilt and accusations of our enemy. A great tactic in spiritual warfare is for the enemy to accuse. When we admit the truth, he has no more “ammunition” and must walk away in defeat! Galatians 5:7 – You were running well; who hindered you from obeying the truth? Truth is usually the first area we will stumble in, in our Christian walk. We usually don’t get up one morning and decide to completely turn our back on God and live in a sinful, rebellious state. It starts with a little lie from our enemy that we allow to take root in our heart. John 17:14-17– I have given them Your word; and the world has hated them, because they are not of this world, even as I am not of the world. I do not ask You to take them out of the world, but to keep them from the evil one. They are not of the world, even as I am not of the world. 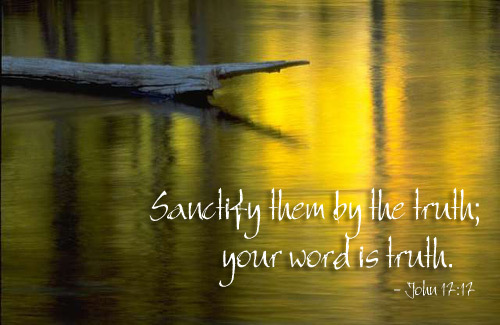 Sanctify them in the truth; Your word is truth. The words of God are truth. Jesus came not only to tell us God’s word, but to be God’s word in us. The word (truth) is what separates us and keeps us from our enemy, the evil one, and the world he rules. It protects us as we live in his earthly domain, but are certainly not part of it. Truth is a defense to keep us from the evil one. And truth sanctifies us – as we live and believe the truth found in God’s word, we will find ourselves looking, sounding, and acting quite different from the world. The belt of truthholds everything together in the armor of God. Just as the Roman soldier “tucked up” his robes in his belt when he went into battle, the truth gives us freedom – we can live our lives fully within the confines of God’s truth. Truth defines righteousness (our breastplate). Truth strengthens our faith (our shield). Truth is proclaimed in the gospel (our shoes). Because salvation (our helmet) is true, it protects our mind, giving us a clean conscience. Our sword (the word of God) hangs on truth, so it becomes active and powerful as our offensive weapon. As grateful believers, let’s wrap our lives in the truth, just as Samuel admonished the people of Israel in 1 Samuel 12:24: Only fear the Lord and serve Him in truth with all your heart; for consider what great things He has done for you. 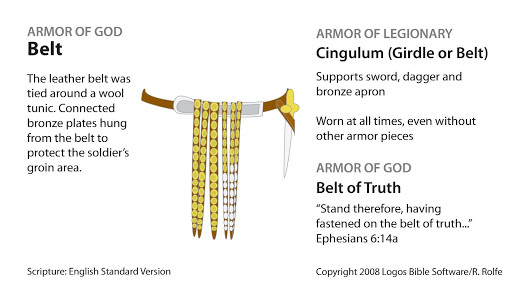 The Armor of God: Stand Firm!